Operating revenue is Rs. 58.23 crores in Q2FY18 as against Rs. 54.72 crores in Q2FY17. 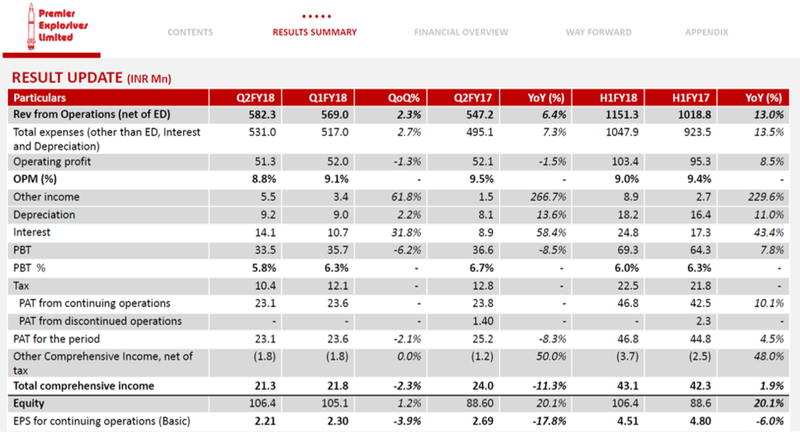 Operating profit this quarter is Rs. 5.13 crores as against Rs. 5.12 crores in Q2 FY17 i.e. a growth of 6.4%. PBT stood atRs. 3.35 crores as compared toRs.3.66 crores in Q2 FY17.PAT stood at 2.31 crores as compared to 2.52 crores in Q2 FY17. Operating revenue is Rs. 115.13 crores as against Rs. 101 croresin H1 FY17, a growth of 13%. Operating profit for this half year has been at Rs. 10.34 crores as against Rs. 9.53 crores in previous year, a growth of 8.5%. PBT stood at Rs. 6.93 crores as compared to Rs. 6.43 crores previous year. PAT is Rs. 4.68 crores as compared to Rs. 4.48 crores in the previous year, a growth of 4.5%. As on 30 September 2017, order book was Rs.356 crores. Order breakup comprised of commercial explosive business at Rs. 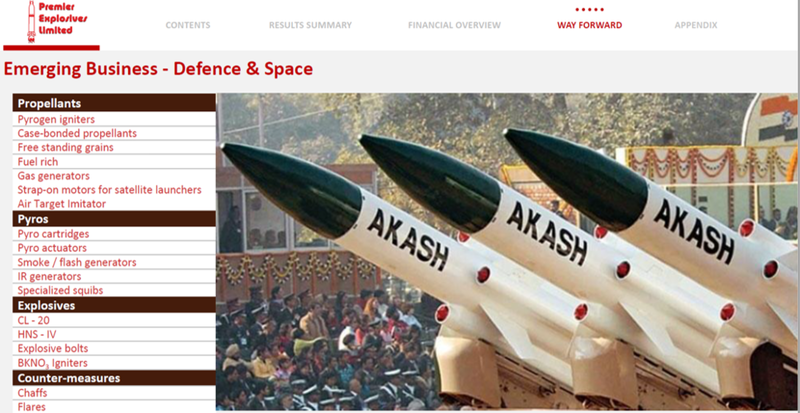 216 crores, defense explosive business at Rs. 142 crores and service business at Rs. 31 crores. Rs. 216 crores of commercial business includes the order from Coal India which PEL received recently. Raw material costs have gone up because consumption remained same but the prices have increased by more than 10% in certain cases, while the price offered by coal India has reduced by 10%. The jump in cost of raw material is not because of some trial runs for the ISRO contract as the plant under this contract is still under construction. Receivables and Inventories increased because of demonetization and GST. Earlier, 13.36% was excise duty and 14.5% was sales tax. The total came to around 28%. The GST is 18%. So during the transaction period from the old system to the new system, nobody paid the bills as they were waiting for the duties to come down and then making advanced payments. Targeted revenue from defense is estimated to be around Rs. 270 crores. In defense, orders are basically from BDL and sustainer order is going on. PEL is expecting orders from other customers but cannot reveal the names as their competitors would also be trying to get those orders. A new plant of BDL was inaugurated recently that’d be used for integration and not for production. So production will still come through private industry. Propellant composition of PEL for LRSAM, MRSAM and Astra projects has been approved. So, PEL is expecting orders in the future. 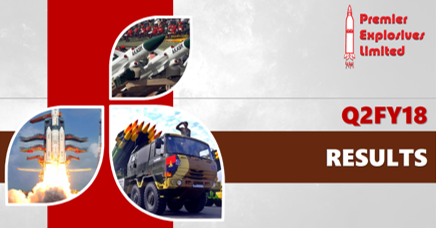 DRDO with the help of HEMRL is developing solid propellant for BRAHMOS PJ-10 missile after Russia refused support. PEL has sent their express of interest. So when the order comes, PEL will certainly be a part of it. PJ-10 is a cruise missile and it has been developed over a long period of time. So production of this will not be a problem. It will be a stable order. 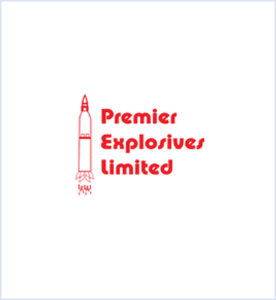 PEL have got the industrial license and the approval from Chief Controller Explosives and building a factory for Pelnext Defense Systems, a subsidiary. There would be technological tie-up with an OEM and they are in the final stages of negotiating. The name of OEM cannot be revealed due to confidentiality. 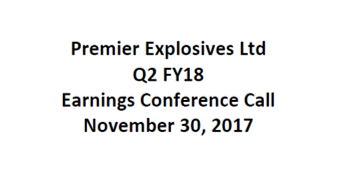 Ongoing CAPEX is online as PEL have got the approval of chief controller of explosives and by the end of FY18, will most probably start the production in the new plant for producing high explosives, some warheads and also some mines. PEL has been allotted 220 acres of land by Andhra govt. to set up the facility of making upto 2-meter diameter propellant for SHAR, i.e. Indian Space Research Organization at SDSC Sriharikota. SHAR have requirement of “Strap-on motor”. It needs 3 sections of propellants. PEL has delivered the first section at the existing plant. For meeting future requirements, PEL is setting up the facility next to SHAR. SHAR needs 3 strap-on motors i.e. order of 9 sections every month. So it is bound to become a large order. SHAR will also be buying raw materials like Ammonium Perchlorate from PEL. Size of these orders cannot be revealed because of commercial reasons. 8 RFPs which are floated in the month of November for ammunition contracts have been postponed to 10th December 2017. PEL have already got a building totally dedicated for the production of Chaffs and Flares. PEL are also thinking of contacting other companies in the world producing flares because there is a massive requirement for chaffs and flares in the navy and other branches of ordinance. There is some progress in the MOU with Israel Aerospace but nothing can be revealed unless the whole thing is transformed into a business. Israeli ATGM project was called off by Ministry of Defense (MOD) hence no investment has been made in that direction by PEL.